Throughout the month of May, we've been working hard to sign up new monthly sustainers to help us make sure the VMC has a strong future of grassroots reporting in Vancouver. 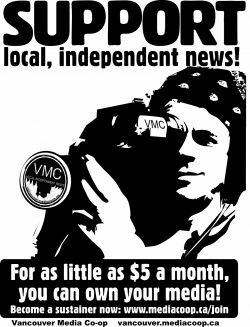 If you can, please donate or become a sustainer today (added bonus, if you sign up in May you'll get a free book and three free subscriptions to The Dominion). Click the audio link above to hear an appeal from one of our supporters, Mordecai Briemberg, co-host of Co-op Radio's program Redeye.